John (not his real name) will be taking it one day at a time, every day for the rest of his life. However, the challenge of remaining abstinent from alcohol is accompanied by the rewards of achieving things he never thought possible. Only half of the patients who walk through the front door of the Lyndon Community will complete the three month rehabilitation program, and not all of them will remain abstinent when they leave. By its own admission, the 12-step Alcoholics Anonymous program on which the Lyndon Community is based has a success rate of about five per cent. That figure goes some way to demonstrating the enormous challenge faced by people who start out on the road to recovery. Lyndon has been operating as a drug and alcohol rehabilitation centre for 25 years and works on a therapeutic community model. Lyndon program director Norm Henderson said total abstinence from drugs, alcohol and gambling was the first challenge for clients. “They don't just come and lay back in lounge chairs for three months. There is random testing, and to the best of our ability they're completely drug-free. We do end up with what I suppose you'd call worst case scenarios. We have people who have tried before. The majority of clients here have been in the criminal justice system and have other issues, like their families have broken up. We try to create an environment where people feel safe. The staff get to know them very well,” he said. John, 40, was one of those clients who had tried before and came to Lyndon via the court system. He started drinking in the usual way – with friends. “I just started off socially drinking when I was young. I would always drink more than my friends. I was married young but I was still being responsible, my daughter was born and I was working hard. My marriage got rocky and I started drinking more. Things started getting me down and I drank even more. It's a spiral. You wake up depressed in the morning and the only way out is to have another drink,” he said. While he didn't end up “derelict in a park”, John believes there are many ways to hit rock bottom. “I spent the last 10 years prior to going there on and off drinking with a few attempts to rehabilitate, but nothing serious. I moved up from Sydney, thinking I could get away from it. It was mainly the court that put me in Lyndon. I'd lost my licence for the fourth time drink driving. Jan Stevenson (the local Magistrate) gave me community service or 12 months in prison. I didn't turn up a couple of times, so then I had to go to rehab or go to jail, and I didn't want to go to jail,” he said. In about 18 months since completing the Lyndon program, John has resumed his life. He is working for his own business, renovating his house and rebuilding relationships that broke down because of alcohol. “I left there with no money and a suitcase full of clothes. I decided to stay on in Canowindra. I couldn't see myself changing if I came back to old environments. I'm doing things now that I should have been doing when I was 20. It's taught me a much better way to live. Every day I achieve things that astound me,” he said. Mr Henderson said about 20 people who had successfully completed the program had chosen to live in and around Canowindra, and most of them were working. 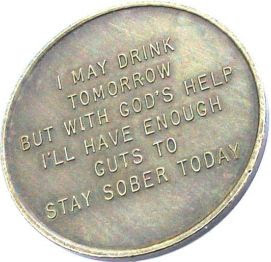 For people addicted to alcohol and drugs, recovery means staying completely abstinent forever. That is easier said than done in a culture where socialising is often automatically associated with drinking. “All through my life, everything I did involved alcohol. My friends were all drinkers. That's why it's been pretty hard to change my life now. I really had to cut myself off from everyone. It's only now I'm feeling comfortable going to family things where I know there's going to be grog. The obsession is gone. I have to remind myself now that I am an alcoholic, and one drink will get me back where I started,” John said. Not all of the people John met at Lyndon have made it through the rehabilitation program, and some will never get a second chance. “I've never been confronted with more death. That's pretty hard to take, but it also reinforces to me where I could end up if I went back to my old ways,” he said.